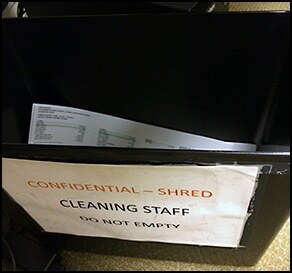 Shred Bin Security — How to upgrade it… probably for free! If you have a sizable contract with a shredding company, keep reading. Your organization realizes they need help getting rid of their wastepaper. Some of it can be recycled. Easy. There are plenty of recycling companies around. Some of it, however, contains sensitive information that must be destroyed. So, you contact your local “I-Rip-A-Part” shredding company. You are offered your choice of two shred bin styles, if you are lucky. The elegant particle board beige box, or the converted garbage can. Both scream security joke. But hey, they only gave you two choices. So, you take what “I-Rip-A-Part” gives you. After all, it’s their business. They know best. Pretty soon these start popping up. Just the office snoops, competitive intelligence professionals, activists, news media, hackers, etc. A lack of understanding about information security on the part of the confidential information custodians. Most shred bins being provided by shredding companies are nothing more than security theater; a mental bandage playing to the threat. They are inexpensive, ineffective, and won’t prevent any semi-espionage adept person from taking what’s inside. 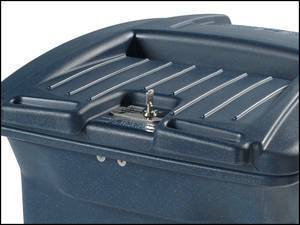 Attacks include: unscrewing the cabinet, picking the cheap lock, sticking a $8.00 flexible grabber through the slot, bending the plastic lid back, or pulling the inner liner bag through the slot. The worst case we’ve come across was a box whose bottom was intentionally kicked in. Two of the four 1/4″ dowels holding the bottom in place broke, leaving the other two to act as pivot points. The box looked secure, but tip it forward and the bottom became the Ali Baba, “open sesame,” swinging door to information riches. We had a shredding company tell one of our clients, “If someone really wants to break into a bin, the additional locks won’t add much protection.” That’s pathetic. Think about it. They are in the protection business, and they complacently admit this is the best they can do? They went on to scare my client with the monstrous cost of converting all of the bins. Customers deserve better. Security providers should be providing creative thinking and problem solving advice, not lazy excuses. Don’t believe Mr. “I-Rip-A-Part.” (Go ahead, say it fast.) 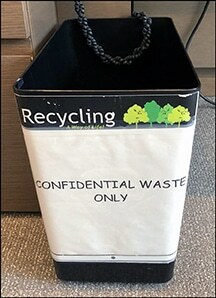 Quality shred bins which will really keep your confidential wastepaper safe are available. They cost more, but a whole lot less than the cost of stolen information. The best part is, you can demand your shredding company provide them, or you’ll go to a vendor who will. This is the type of high-security bin my European clients are using. They take information security very seriously. It’s the best I have ever seen, but not readily available in the U.S.
To the right is one of the best high-security bins I can currently find for my U.S. clients. You can also see a more office setting style, all-metal one here. There may be others, search around, but don’t settle for less. This one has a high security lock and arms under the lid that extend fully to the left and right side of the bin, thus keeping the lid from being pried open. Generally speaking, shredding companies provide bins that suit their purpose, not the customer’s. Some are constructed of cheap particleboard held together by wood pegs (see photo), and many of those are not assembled properly. They can be opened easily from the bottom. Just undo the exposed screws. The plastic bins usually just lock the front center of the bin, leaving the sides vulnerable to forced entry. Almost all the bins provided by the “I-Rip-A-Part” cartel have easily pickable locks, and we’re talking paper clip pickable. During our information security inspections we also see the locks which are not even being used. Ok, that’s not the vendor’s fault. You have to keep on top of these things. The double whammy is the garbage bin which has been hacked into a “security” shred bin by carving out a slot in the top, and pop-riveting a hasp on the front. These crummy bins may be fine for holding bulk amounts of outdated, semi-sensitive documents awaiting shredding. 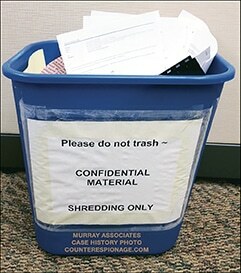 However, sensitive and highly confidential, bulk shredding require better shred bin security.